The unassuming disposition of Alcorn State’s head football coach Fred McNair falls right in line with the institution he represents. Both are quiet, reserved, and modest in countenance, yet vast in appearance. Though if you take time and dig deeper, you’ll see a rich history interwoven connecting the two. Dating all the way back to 1992- 94, continuing to Alcorn State’s past 3 SWAC Championships, five straight Eastern Division titles along with 2014’s HBCU national title, there has been one lucky charm, a common thread so to speak…Fred McNair. In the Steve McNair era, it was Fred McNair (also known as “Original Air”) who first recruited and then cultivated Steve’s eminence talent for Alcorn. Whether by phone, being the big brother of counsel, or by combing through film analyzing coverages and quarterback mechanics, Original Air was there for Steve and Alcorn. Unbeknownst to most, Fred McNair was honing his talents of being a recruiter and QB whisperer of sorts with Steve. Fred has proven to be quite the recruiter for Alcorn State once more, hauling in five, yes, five 3-star recruits on offense alone this past signing day for the Braves. Once former Braves head coach Jay Hopson pegged Fred as the quarterbacks coach/assistant head coach in 2012, Fred went to work. Enter John Gibbs Jr., McNair’s first assignment. Gibbs was a prospect who wasn’t known as much of a passer his freshman year with just a 48 percent completion percentage for 1,406 yards and eight touchdowns, but as we eventually witnessed, he had something. Gibbs had a twinkling; a spark that was recognized by the coaching staff that was needed for this Braves squad. By 2014, his Junior year, Gibbs had transformed into a champion and filled out his 6-6 frame. He managed to throw 189-of-324 passes for 2482 yards, and 21 touchdowns, combined with 1,006 rushing yards on 135 carries and 11 touchdowns. When Gibbs’s season was cut short by injury in 2015, backup Lennoris Footman stepped right in. Living up to his namesake, Footman led the Braves in spectacular fashion leading the team to another SWAC championship and Celebration Bowl appearance. Footman proved to be a consummate leader for the Braves. Only injuries hampered him as he saw his completion percentage rise from a mere 40% to 60% by his senior year under McNair’s tutelage. 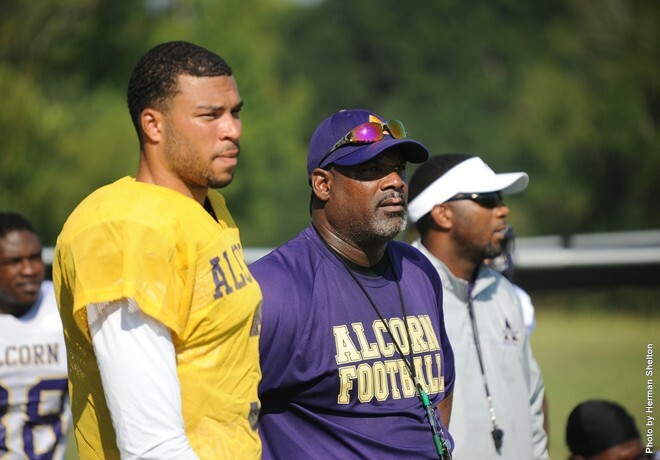 Next in line to lead Alcorn State was incumbent Noah Johnson, an extremely talented player, but raw. How could now head coach McNair harness his skill set to maintain the Braves’ championship form? In my opinion, it all culminated during a precarious time during the 2018 season: homecoming versus Alabama State. Johnson struggled mightily, but despite his struggles, Alcorn still dominated the matchup and probably could have easily won that game with Johnson at the helm. Instead, McNair’s uncanny vision led him to sit Johnson as fans and teammates alike watched in agony as Alcorn succumbed to the Hornets in a tough 28-25 overtime loss on that clement day. What fans, teammates, and Johnson learned were that McNair needed him to be at his absolute best at all times to navigate the treacherous SWAC waters ahead. Going into the 2018 season, McNair knew his Braves faced a steep 10-game stretch without a single bye week until the final week of the season. There could be no more missteps in SWAC play. Johnson responded emphatically, throwing for 2207 yards and 15 touchdowns (boasting a 62 percent completion percentage) while rushing for 1080 yards and 11 touchdowns. Johnson finished the season as a SWAC champion and SWAC Offensive Player of the Year in 2018. Fred McNair’s gamble paid off. He raised the SWAC trophy with his players and staff in jubilation in the Braves’ first-ever home-based SWAC Championship Game. He is proving to be a savant for Alcorn. It was his first SWAC championship as head coach, his third as a member of the coaching staff, and fifth … as a common thread.